This Post has already been read 1381 times. Ufone has accentuated its ongoing commitment to sports in Pakistan by signing up the top golfers Pakistan has to offer. This is the first time in the history of Pakistan that golf has been endorsed at such a massive country wide scale. 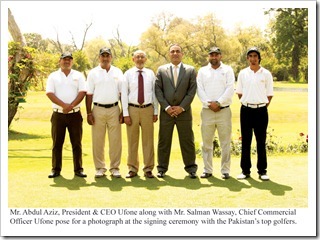 The endorsement shall give Pakistan golf a chance to gain international exposure and acclaim. By signing on Shabbir Iqbal (Pakistan No. 1), Matloob Ahmed (Pakistan No. 2), Muhammad Munir (Pakistan No. 3) and Mubariz Ahmed (Pakistan Junior Champion), Ufone has reaffirmed its conviction to support sports in the country. Speaking at the occasion Abdul Aziz President & CEO Ufone said that these gentlemen have, had a great career and it is indeed a great opportunity for them to share their talent with the whole nation.